The Junior Service League (JSL) of Boca Raton was founded in 1971, its purpose was to provide an ongoing program of education, to train volunteers and encourage leadership in community service. 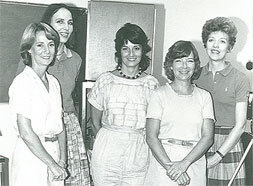 The JSL of Boca Raton’s first president Joan Moseley, who along with the JSL’s second president, LeeAnn Burns, was a driving force behind the establishment of the organization. These two ladies – and 24 more dedicated volunteers – became the charter members to help address the needs of our community through volunteer service. They provided the foundation for the Junior League of Boca Raton as we know it today. The JSL focused on a couple of projects early on including the establishment and organization of the Boca Raton Historical Society (BRHS). The JSL sponsored it, staffed it and funded it until it was ready to stand on its own and in 1976, the JSL gave it to the community. Restoring, preserving and opening the Singing Pines handmade house (circa 1912) as a historical museum, which is today known as the Boca Raton Children’s Museum, was also a major focus of the JSL in the early days. It was our first big community project and many rallied around the JSL to help make it happen, including the Jaycees, The Boca Raton News, the City of Boca Raton and many, many donors in the city. Initially we asked the city for help in the process and they were unbelievably generous and helpful providing the land and some moving assistance. Singing Pines sat for some years after it was moved to its current site on borrowed steel girders while we raised the money. The opening was truly a community event and so much fun. This was the first historic preservation project in the city. In Singing Pines, JSL members were given opportunities for a complete volunteer museum experience by working on exhibitions, docent training, our community outreach programs including Treasure Trunks, Puppets and Activity Days, and in-house programs, public relations and administration. Our talented group also lent our artistry to the community through the painting of a Storybook Character Mural at the children’s wing of the public library led by Kenny Lunsford and assisted by many League members. The JSL also created and developed the structure of our organization and focused on issues related to education, children, alcohol awareness, abused and neglected teenagers and children and adults with disabilities. JSL activities in the 70’s included the Puppet Program, Plant Fiesta, Next To New Sale, Front Porch Consignment Shop, Tennis Tournament and Spring Fiesta and additional projects included Birthline, Alcohol Awareness, Haven for Girls, Planned Parenthood, Society for the Performing Arts, Visiting Homemakers, Morikami, Girl Scouts of America, Turning Point, State Historic Preservation Commission, Children’s Home Society, American Field Service, Advent Gardens, Career Development Instructor and Administrator, Habilitation Center for the Handicapped, Horizons, Legal Aid Society, Debbie Rand Memorial Service League, Boca Middle School & Boca High Clinic, Bethesda Hospital Auxiliary, St. Joan of Arc teaching special classes, Delray Chamber of Commerce, St. Gregory’s Altar Guild, Junior Assembly and the YMCA Delray-Boynton. 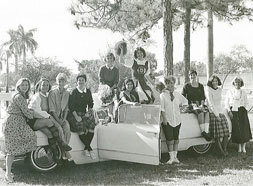 JSL became the Junior League of Boca Raton in our 1983-1984 year, joining the Association of Junior Leagues International.